Jeeves and Wooster was an excellent TV show. Hugh Laurie and Stephen Fry not only embodied their parts but had magnificent chemistry, and the scripts were as faithful as humanly possible. The first season in particular was practically perfect. I was still brooding when I dropped in at the oyster-bar at Buck’s for a quick bracer. I needed a bracer rather particularly at the moment, because I was on my way to lunch with my Aunt Agatha. A pretty frightful ordeal, believe me or believe me not. Practically the nearest thing to being disembowelled. I had just had one quick and another rather slower, and was feeling about as cheerio under the circs, when a muffled voice hailed me from the north-east, and turning around, I saw young Bingo Little propped up in a corner, wrapping himself around a sizeable chunk of bread and cheese. Bingo Little is in one-sided love (his perpetual state throughout the stories), this time with a girl named Honoria Glossop, and wants Bertie to help woo her. Bertie then meets Aunt Agatha for lunch and she tells him that it’s high time he was married. Thanks to the miracle of coincidence, she suggests Honoria as an excellent candidate. Bertie has no ambition whatsoever to get married, and the thought arises that he can solve both parties’ dilemmas at once. He would be off the hook if Honoria was already engaged to Bingo, and he promptly decides to play matchmaker. Besides, Jeeves is on holiday for much of this story, and Bertie feels he needs to prove that he can sort out his own life’s problems without resorting to Jeeves all the time. There’s therefore nothing restraining Bertie from embarking on an utterly hare-brained scheme to unite Honoria and Bingo. It’s hilarious and charming. All of the stories are, really. If you haven’t encountered Bertie Wooster in his original state, pick up an omnibus and use the stories as a snack before bed. That’s what I’m doing; and as today’s story is third in a collection of thirty-four, I have plenty more nights ahead of me. 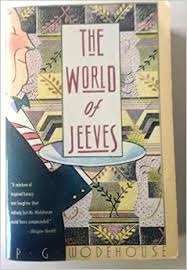 I’m reading from The World of Jeeves (Harper & Row Perennial Library, 1989), which is an excellent paperback edition; fat without being uncomfortable to hold in one hand, a good spine that lies open without cracking, good font size, and an enjoyable reading experience no matter what the material. Great post. He has truly left behind a sunshine bathed world for us to sit back and bask in. Like all literary works, Bertie’s memoirs also lose their depth when converted either into a play or a movie.